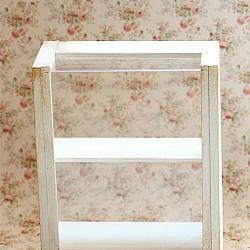 Handcrafted Blythe Doll cake display shelf in a beautiful shade of antique white. Please note that this item is MADE TO ORDER. Please allow 1-3 weeks of crafting time. Carefully painted, and then deliberately distressed, this piece brings an elegant charm altogether! This size is suitable for Blythe Dolls. Perfect if you're building a Blythe Doll cake shop. Please note that this is entirely handcrafted by myself without the use of any machines. 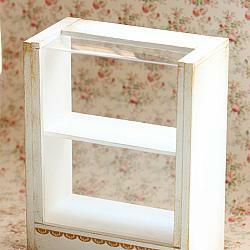 The cake shelf measures approximately 15cm tall, 11cm wide and 6cm deep. NOTE: This item is only suitable for miniature collectors and is not intended for young children.